While viewers may not have met the much talked about but never seen S.H.I.E.L.D Director, played by Jason O’Mara, recent comments from star Elizabeth Henstridge confirm that the tension between former teammates caused by Phil Coulson’s successor will continue through the season. While little else is known about the new Director, Entertainment Weekly has released a new clip from Marvel’s Agents of S.H.I.E.L.D featuring the new Directors debut. The footage features a meeting with the new Director, referred to as Jeffrey, Phil Coulson, and Melinda May. While viewers may have expected a stern demeanor from the Director, especially considering the animosity he has caused between his subordinates, the clip gives us a glimpse at a surprisingly amicable Director. Viewers may want to stick around to the end of the footage though, as a quick reveal suggests his cheerful disposition may be a facade. You can view the full clip below. While it may be awhile before viewers are given more details about O’Mara’s character, fans can continue to speculate on the Directors motive and secrets, especially since he seems to have a particular interest in Agent May. In light of the Sokovia Accords, and with Hydra obliterated, S.H.I.E.L.D. has been legitimized again and no longer needs to operate in the shadows. 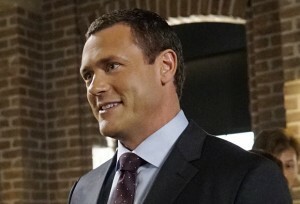 Since the world presumes that Coulson is dead, the organization needed a new Director (Jason O’Mara) to be the face of the organization. Coulson finds himself back in the role as an agent and teamed with Mack (Henry Simmons), and together they are tasked with tracking down and confirming the presence of Enhanced people, aka Inhumans. They have been trying to track down and capture Daisy (Chloe Bennet), aka Quake, who has gone rogue in an attempt to atone for sins from the past. But with the world believing that Daisy is a dangerous outlaw who has taken down banks and bridges, the new Director has no qualms about taking her down for good. Agent May (Ming-Na Wen) is tasked with training specialist strike teams, and Fitz (Iain De Caestecker) and Simmons (Elizabeth Henstridge) have taken a big step forward in their relationship. But with Simmons’ new promotion as Special Advisor to the Director in Science and Technology, Fitz, as well as her former team members, finds it hard to confide in or trust her since she’s now the Director’s confidant. Robbie Reyes (Gabriel Luna) will roar into the lives of Agent Coulson and the team as a junkyard mechanic who can turn on a dime into the terrifying Ghost Rider. Will Robbie be a friend or foe to – as well as the world, itself? Meanwhile, Fitz discovers that socially awkward genius and friend Dr. Radcliffe (John Hannah) has started putting the finishing touches on a new, secret invention. Marvel’s Agents of S.H.I.E.L.D. stars Clark Gregg as Director Phil Coulson, Ming-Na Wen as Agent Melinda May, Brett Dalton as Grant Ward, Chloe Bennet as Agent Daisy Johnson, Iain De Caestecker as Agent Leo Fitz, Elizabeth Henstridge as Agent Jemma Simmons and Henry Simmons as Agent Alphonso “Mack” MacKenzie. Marvel’s Agents of S.H.I.E.L.D. airs Tuesday nights at 10:00 PM ET on ABC.